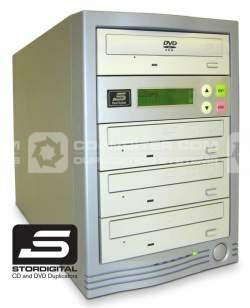 Hard drive: By adding a hard drive to your duplicator it will copy DVDs faster, be more stable, reduce wear & tear, store disc images and unlock controller features. This pre-assembled product has 3 drives. StorDigital is proud to announce the newest addition to its CD duplicator line up. The Karaoke CK-Pro 48/1 offers efficiency and economy like no other CD duplicator can. In addition to duplicating audio and data CDs at 48x the unit will duplicate CD+G (audio and graphics.) Equipped with two Plextor 48/12/40A CDR-RW drives. The duplicator can play CD+G audio tracks through the line out RCA jacks on the back of the case. The Karaoke CK-Pro 48/1 is a fast and reliable stand alone unit (no PC). Using the proven fast 48X Plextor CDR/RW drives for recording and ripping accuracy is assured. No more coasters! The Karaoke CK-Pro 48/1 has a highly intuitive simple to use interface. Pressing just one button will copy from the CD ROM to the CD Recorder. There is no complex operating system to learn. The four-button LCD display interface will guide the user through other procedures. No training is necessary you do not have to be a computer user to operate and there is no set-up - simply plug it in. The Karaoke CK-Pro can burn both CD-R and CD-RW media. The CDD48/1G CD duplicator will not clutter your office with its small foot print. Plus it tips the scales at 12 lbs making it easy to move around. It is capable of over burns multiple speed records (48X 40X 24X 20X 18X 16X 12X 10X 8X 6X 4X 2X & 1X) and much more. The CD duplicator has extensive built-in diagnostics that test the memory and CDR/RW drives. It is clear that the Karaoke CK-Pro 48/1 is about to shake up the industry. No other device can beat it on a point-by-point basis. The Karaoke CK-Pro 48/1 offers CD+G duplication at 8x regular audio and data at 48X speed easy to use interface no complex operating system to learn and data audio and CD+G formats handled with ease. Copies directly from Plextor drive to 48x Plextor recorder with the touch of a single button. Verification of recorded discs to original image - only good copies are ejected. Bad disk due to media are only ejected once the ESC button is pressed. Media: Burns CD-R and CD-RW. Will erase CD-RW. Note:Specifications are subject to change without notice and StorDigital may substitute components of equal or superior quality at its discretion. StorDigital . CK-Pro . 3 . Karaoke . CD . DVD . Copier . Systems .